It was a controversial call by the referee that cost the Philippines the chance for an Olympic medal. Referee Roland Labbe of Canada deducted points from Mark Anthony Barriga in the third round of his fight against Birzhan Zhakypov of Kazakhstan. Labbe warned Barriga for ducking and head-butting, and the call deducted one point from Barriga and added a point for Zhakypov. It was the cause of the loss of the 19-year-old Barriga, by a solitary point, 17-16. If there would have been no two-point deductions, the Panabo boxer could have won by one point. Both of them were deducted points though at the dying seconds of the fight when both of them fell down due to holding and clinging to each other. 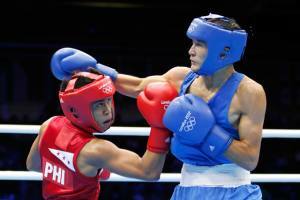 Zhakypov was leading in the first round, 5-4, when Barriga seemed bothered by the height advantage of the Kazakh. But Barriga took things around in the second round by scoring 6-3, with the total scores going his way 10-8 after two rounds. The Kazakh wrestled the Filipino fighter to the ground twice early before Barriga did without any warning from Labbe. Although ABAP is filing a protest before the jury, Barriga’s courage against the taller, heftier and older Zhakypov deserved the adulation of the millions of Filipinos watching on TV. By the next Olympics, Barriga will be a ripe 23 year-old boxer and will be at his peak if he trains seriously. He was the only hope for the Olympic medal and that optimism was fizzled out by the oppressive referee. China’s Zou Shiming, whom Barriga prepared thoroughly for the next round should he won against the Kazakh, won over Yosbany Soto of Cuba, 14-11. Barriga has to develop his stamina as he lost gas during the third round. Honing up his skills would give him a better chance for the medal in 2016 in Rio de Janiero. He has nothing to be ashamed of. It was a controversial loss and millions of Filipinos looked at it as a win stolen from him by the referee.